Harbor Island Black, one of the seemingly hundreds of courses (seriously, how does he crank them out so fast?) by Jeremy Blaylock (tastegw), is also one of the best--and first--links offerings in The Golf Club. Blaylock is one of the foremost innovators in the Greg Norman Course Designer, as he is always able to find a new way to use an old tool or object. Seemingly limitless in imagination, Harbor Island Black is a culmination of 5 star features throughout. The effort at Harbor Island Black is obvious from the first tee shot, which is always a trademark of Blaylock's courses. Much like the opening line of a novel, Blaylock steps up his game on the opening hole. Playing over an inlet created using the brick bridge object as a retaining wall, the opening tee shot forces the player to make a decision about how aggressive to be without even giving a warm up. The player needs to get over this mental hurdle quickly, because this entire golf course is one big risk/reward chess game. Multiple routes are available to every hole. A short course at only 6800 yards playing to par 72, there is no room for error on any single shot (especially when the wind is up). Bunkers are strategically placed and mostly quite deep, and the greens are protected by runoffs, water hazards, and more bunkers. Focus is paramount from hole one to hole eighteen. As with many of Blaylock's other courses, the greens are receptive but maxed-out on speed. It's very easy to forget how fast they are, and the player will inevitably pound a downhiller or two through the break, causing a power lip-out, at least once per round. The greens are very fair, but any putt from above the hole must be caressed, not struck. Hole five is a standout, as the split fairway on this long par 4 will allow a "high road/low road" approach. The high road is shorter and more elevated, but heavily bunkered. The low road is wide open, but forces the player to hit a semi-blind long iron to a small-ish green. For me, the wind speed dictates which road to take, but the low road is nearly always a safe bet. Hole seven is unique in that it's a par 5, which plays over 540 yards, and presents an enormous S shaped fairway that has 0 bunkers. The green is bunkerless as well. But despite the lack of sand, there are two or three very demanding shots required to get home. Holes 8 and 9 are back-to-back par 4s that play under 300 yards, despite their carded yardage. As mentioned in my other reviews, I love short par 4s, and these two are about as well-crafted as they come. Eight, especially, is an evil temptress. I've seen players make 2 and 8 on that hole with a very small margin of error making up the difference. One of the few flaws this course has, however, is the distance between 8 green and 9 teebox. From a flow aspect, this part of the design didn't make as much sense to me. But, the way the two holes are laid out make up for this anomaly. Like Whispering River by Dan Hebert (and, coincidentally, released on the same day) Blaylock's Harbor Island Black finishes with two back-to-back par 5s on seventeen and eighteen. 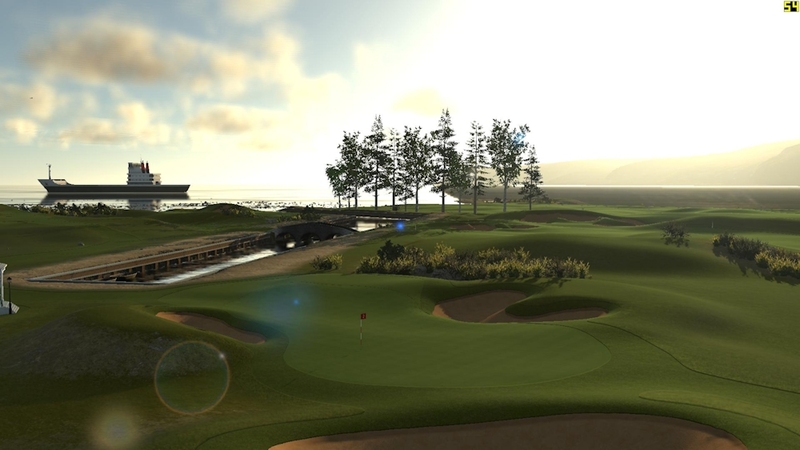 For my money, 17 is the best hole on the course, as it requires a precise, somewhat uphill tee shot which leaves a towering second shot to a green well below the fairway's surface, allowing for an extravagant view of the detail throughout the course. I could gush about eighteen, as well, but that hole will be left to you, the reader, to discover. Harbor Island Black is without a doubt worthy of our 5 Star Badge of Approval. 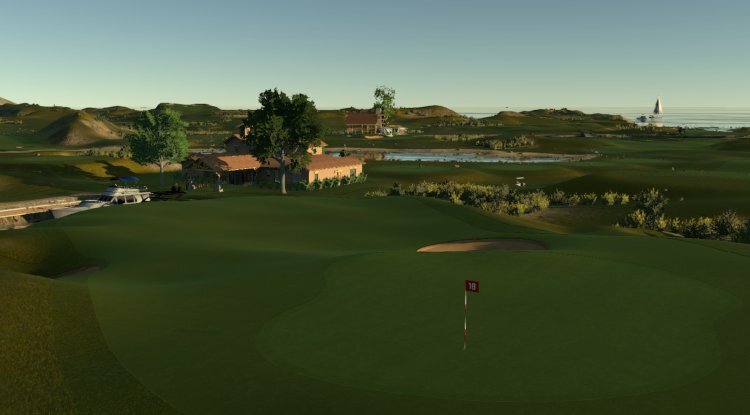 This masterpiece is simply one of the best "short" courses out there. Highly recommended. 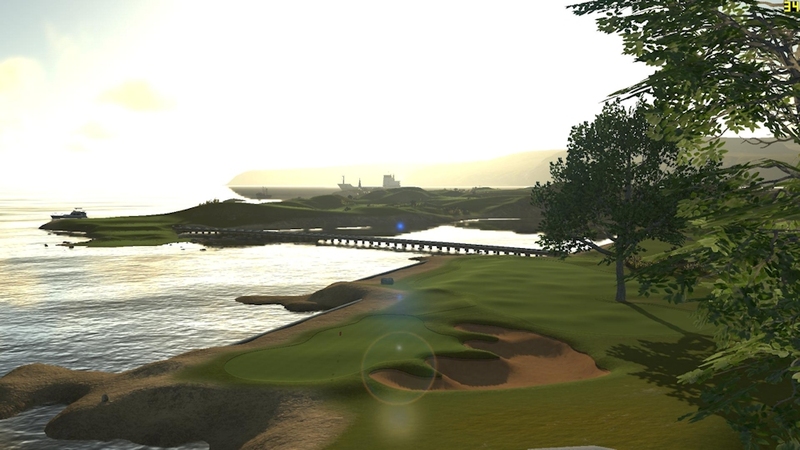 Nice links course with some really good design. The retaining walls with the bridges is awesome. There were a lot of blind shots but still fun.